Welcome to BBM Trading. Furniture & Home Ware. 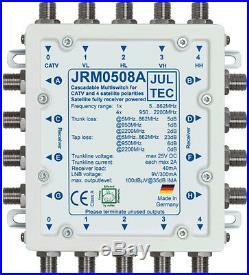 Jultec JRM0508T Multiswitch 5 in 8 out No PSU Powered By The Satellite Receiver. The devices JRM0508A, JRM0508M and JRM0508T are multiswitches for complete receiver-fed distribution networks for a satellite system. With a new energy-efficient Powermanagement concept, a single receiver is able to supply both the multi-switch and the connected quattro-LNB with energy. This means that no power supply is required at the multi-switch and there are no standby losses (ie absolutely no power consumption when all receivers are switched off). A conventional satellite receiver (DVB-S / S2) with 14V / 18V / 22kHz control can be operated on each of the 8 outputs (also TV with integrated satellite receiver). All device variants are also suitable for the distribution of terrestrial signals (FM, DAB +, DVB-T / T2, 3-hole stereo socket such as JAD300TRS) and distribution of cable television signals including Internet access / telephony (DVB-C / C2) Including DOCSIS 3, use a 4-hole can, such as JAD400TRSM. This distribution works even without satellite receiver! The JRM0508A has trunk / cascade outputs, the JRM0508T is terminated (as a single or terminator). The JRM0508M is cascadable in the satellite ZF, in the Terrestrial terminated. The power requirement per receiver does not increase with cascading. Product features Application example: Receiving a satellite signal and distributing it on up to eight SAT receivers Cascadable (expandable) Number of outputs: 8 Isolation port to port (Sat):> 26 dB Max. BBM Trading Ltd Company Registration number: 05554913 and VAT number: GB115 1373 50 Launched in 2005 we have built a reputation on delivering quality goods along with first class customer service. To prevent fraud items are only sent to the card holders billing address. We provide invoices displaying the UK’s current VAT rate. You do not need to give us any reason for cancelling your contract, nor will you have to pay any penalty. You cannot cancel your contract if the goods you have ordered are viewing cards and their subscription has been started. Package the items securely and send them to us with the invoice. Note that you will be responsible for the costs of returning the goods to us unless we delivered the item to you in error. The card is NOT covered if broadcasting stops due to the broadcaster going out of business or a change in schedules, or if the broadcast infringes UK broadcast law. If this is the case we are not liable for this action and you have bought said subscription cards with this knowledge. We reserve the right to withdraw any item or offer at anytime. Unfortunately this isnt always in our control, and mistakes and breakages do happen. On expensive items it might also be a good idea to insure the goods for their full value, as we cannot accept liability for any damage or lost items incurred in transit. Whilst at all times, we try to assure you of the best possible service, however in accepting this, your statutory rights are not affected or limited in any way. Once you place an order you can cancel the order by calling us on within 1 hour of placing it (this should guarantee that your order has not already been picked and sent). UK law is the applicable law. We do not pass-on or sell customers contact details. On-line credit-card saftey is our main goal please see our security page for info. We never send out unsolicited emails 7. WEEE Requlations The Waste Electrical and Electronic Equipment (WEEE) Directive is now UK law. The legislation aims to make producers pay for the collection, treatment and recovery of waste electrical equipment. The regulations also mean that suppliers of equipment like high street shops and internet retailers must allow consumers to return their waste equipment free of charge. The amount of WEEE we throw away is increasing by around 5% each year, making it the fastest growing waste stream in the UK. Much of the UKs WEEE ends up in landfill, where the lead and other toxins it contains can cause soil and water contamination. This can have a harmful effect on natural habitat, wildlife and also human health. Many electrical items that we throw away can be repaired or recycled. Recycling items helps to save our natural finite resources and also reduces the environmental and health risks associated with sending electrical goods to landfill. Distributors of new Electric and Electronic Equipment (EEE) have a part to play in reducing the amount of WEEE going into landfill sites. For example, if a customer bought a new satellite receiver from us we would accept their old satellite receiver and prevent it going into a landfill site by disposing of it safely. Customers must return their WEEE item to us within 28 days of purchasing their new item. How do I recycle my old products? Products are marked with this symbol above to remind you not to throw your electrical equipment in your bin with normal household waste but to arrange for the product to be recycled. Please carefully package any item to avoid transit damage. We will then deal with the waste product in an environmentally responsible manner, at no cost to you. You can also take it to your local council recycling centre to be disposed in an environmentally responsible manner. We cannot reimburse carriage charges for this service. A little about us.. We’re a UK Based leading supplier of Satellite supplies, Audio visual supplies and home & office furniture. The item “Jultec JRM0508T Multiswitch 5 in 8 out No PSU Powered By The Satellite Receiver” is in sale since Sunday, February 11, 2018. This item is in the category “Sound & Vision\TV Reception & Set-Top Boxes\Satellite Multiswitchers”. The seller is “bbm_trading_ltd” and is located in Tonbridge. This item can be shipped to United Kingdom, Austria, Belgium, Bulgaria, Croatia, Cyprus, Czech republic, Denmark, Estonia, Finland, France, Germany, Greece, Hungary, Ireland, Italy, Latvia, Lithuania, Luxembourg, Malta, Netherlands, Poland, Portugal, Romania, Slovakia, Slovenia, Spain, Sweden, Australia, United States, Russian federation, Canada, Japan, New Zealand, China, Israel, Hong Kong, Norway, Indonesia, Malaysia, Mexico, Singapore, South Korea, Switzerland, Taiwan, Thailand, Chile. Welcome to BBM Trading. Furniture & Home Ware. Jultec JRM05012A Multiswitch 5 in 12 out No PSU Power By The Satellite Receiver. The devices JRM0512A, JRM0512M and JRM0512T are multiswitches for complete receiver-fed distribution networks for a satellite system. With a new energy-efficient Powermanagement concept, a single receiver is able to supply both the multi-switch and the connected quatro-LNB with energy. This means that no power supply is required at the multi-switch and there are no standby losses (ie absolutely no power consumption when all receivers are switched off). A conventional satellite receiver (DVB-S / S2) with 14V / 18V / 22kHz control can be operated on each of the 12 outputs (also with TV with integrated satellite receiver). All device variants are also suitable for the distribution of terrestrial signals (FM, DAB +, DVB-T / T2, 3-hole stereo socket such as JAD300TRS) and distribution of cable television signals including Internet access / telephony (DVB-C / C2) Including DOCSIS 3, use a 4-hole can, such as JAD400TRSM. This distribution works even without satellite receiver! The JRM0512A has trunk / cascade outputs, the JRM0512T is terminated (as a single or terminator). The JRM0512M is cascadable in the satellite IF, terrestrial terminated. The power requirement per receiver does not increase with cascading. Product features Application example: Receiving a satellite and distributing it on up to 12 satellite receivers Cascadable (expandable) Number of outputs: 12 Isolation port to port (Sat):> 26 dB Max. BBM Trading Ltd Company Registration number: 05554913 and VAT number: GB115 1373 50 Launched in 2005 we have built a reputation on delivering quality goods along with first class customer service. To prevent fraud items are only sent to the card holders billing address. We provide invoices displaying the UK’s current VAT rate. You do not need to give us any reason for cancelling your contract, nor will you have to pay any penalty. You cannot cancel your contract if the goods you have ordered are viewing cards and their subscription has been started. Package the items securely and send them to us with the invoice. Note that you will be responsible for the costs of returning the goods to us unless we delivered the item to you in error. The card is NOT covered if broadcasting stops due to the broadcaster going out of business or a change in schedules, or if the broadcast infringes UK broadcast law. If this is the case we are not liable for this action and you have bought said subscription cards with this knowledge. We reserve the right to withdraw any item or offer at anytime. Unfortunately this isnt always in our control, and mistakes and breakages do happen. On expensive items it might also be a good idea to insure the goods for their full value, as we cannot accept liability for any damage or lost items incurred in transit. Whilst at all times, we try to assure you of the best possible service, however in accepting this, your statutory rights are not affected or limited in any way. Once you place an order you can cancel the order by calling us on within 1 hour of placing it (this should guarantee that your order has not already been picked and sent). UK law is the applicable law. We do not pass-on or sell customers contact details. On-line credit-card saftey is our main goal please see our security page for info. We never send out unsolicited emails 7. WEEE Requlations The Waste Electrical and Electronic Equipment (WEEE) Directive is now UK law. The legislation aims to make producers pay for the collection, treatment and recovery of waste electrical equipment. The regulations also mean that suppliers of equipment like high street shops and internet retailers must allow consumers to return their waste equipment free of charge. The amount of WEEE we throw away is increasing by around 5% each year, making it the fastest growing waste stream in the UK. Much of the UKs WEEE ends up in landfill, where the lead and other toxins it contains can cause soil and water contamination. This can have a harmful effect on natural habitat, wildlife and also human health. Many electrical items that we throw away can be repaired or recycled. Recycling items helps to save our natural finite resources and also reduces the environmental and health risks associated with sending electrical goods to landfill. Distributors of new Electric and Electronic Equipment (EEE) have a part to play in reducing the amount of WEEE going into landfill sites. For example, if a customer bought a new satellite receiver from us we would accept their old satellite receiver and prevent it going into a landfill site by disposing of it safely. Customers must return their WEEE item to us within 28 days of purchasing their new item. How do I recycle my old products? Products are marked with this symbol above to remind you not to throw your electrical equipment in your bin with normal household waste but to arrange for the product to be recycled. Please carefully package any item to avoid transit damage. We will then deal with the waste product in an environmentally responsible manner, at no cost to you. You can also take it to your local council recycling centre to be disposed in an environmentally responsible manner. We cannot reimburse carriage charges for this service. A little about us.. We’re a UK Based leading supplier of Satellite supplies, Audio visual supplies and home & office furniture. The item “Jultec JRM05012A Multiswitch 5 in 12 out No PSU Power By The Satellite Receiver” is in sale since Sunday, February 11, 2018. This item is in the category “Sound & Vision\TV Reception & Set-Top Boxes\Satellite Multiswitchers”. The seller is “bbm_trading_ltd” and is located in Tonbridge. This item can be shipped to United Kingdom, Austria, Belgium, Bulgaria, Croatia, Cyprus, Czech republic, Denmark, Estonia, Finland, France, Germany, Greece, Hungary, Ireland, Italy, Latvia, Lithuania, Luxembourg, Malta, Netherlands, Poland, Portugal, Romania, Slovakia, Slovenia, Spain, Sweden, Australia, United States, Russian federation, Canada, Japan, New Zealand, China, Israel, Hong Kong, Norway, Indonesia, Malaysia, Mexico, Singapore, South Korea, Switzerland, Taiwan, Thailand, Chile. Welcome to BBM Trading. Furniture & Home Ware. Jultec JRM05012T Multiswitch 5 in 12 out No PSU Power By The Satellite Receiver. The devices JRM0512A, JRM0512M and JRM0512T are multiswitches for complete receiver-fed distribution networks for a satellite system. With a new energy-efficient Powermanagement concept, a single receiver is able to supply both the multi-switch and the connected quatro-LNB with energy. This means that no power supply is required at the multi-switch and there are no standby losses (ie absolutely no power consumption when all receivers are switched off). A conventional satellite receiver (DVB-S / S2) with 14V / 18V / 22kHz control can be operated on each of the 12 outputs (also with TV with integrated satellite receiver). All device variants are also suitable for the distribution of terrestrial signals (FM, DAB +, DVB-T / T2, 3-hole stereo socket such as JAD300TRS) and distribution of cable television signals including Internet access / telephony (DVB-C / C2) Including DOCSIS 3, use a 4-hole can, such as JAD400TRSM. This distribution works even without satellite receiver! The JRM0512A has trunk / cascade outputs, the JRM0512T is terminated (as a single or terminator). The JRM0512M is cascadable in the satellite IF, terrestrial terminated. The power requirement per receiver does not increase with cascading. Product features Application example: Receiving a satellite and distributing it on up to 12 satellite receivers Cascadable (expandable) Number of outputs: 12 Isolation port to port (Sat):> 26 dB Max. BBM Trading Ltd Company Registration number: 05554913 and VAT number: GB115 1373 50 Launched in 2005 we have built a reputation on delivering quality goods along with first class customer service. To prevent fraud items are only sent to the card holders billing address. We provide invoices displaying the UK’s current VAT rate. You do not need to give us any reason for cancelling your contract, nor will you have to pay any penalty. You cannot cancel your contract if the goods you have ordered are viewing cards and their subscription has been started. Package the items securely and send them to us with the invoice. Note that you will be responsible for the costs of returning the goods to us unless we delivered the item to you in error. The card is NOT covered if broadcasting stops due to the broadcaster going out of business or a change in schedules, or if the broadcast infringes UK broadcast law. If this is the case we are not liable for this action and you have bought said subscription cards with this knowledge. We reserve the right to withdraw any item or offer at anytime. Unfortunately this isnt always in our control, and mistakes and breakages do happen. On expensive items it might also be a good idea to insure the goods for their full value, as we cannot accept liability for any damage or lost items incurred in transit. Whilst at all times, we try to assure you of the best possible service, however in accepting this, your statutory rights are not affected or limited in any way. Once you place an order you can cancel the order by calling us on within 1 hour of placing it (this should guarantee that your order has not already been picked and sent). UK law is the applicable law. We do not pass-on or sell customers contact details. On-line credit-card saftey is our main goal please see our security page for info. We never send out unsolicited emails 7. WEEE Requlations The Waste Electrical and Electronic Equipment (WEEE) Directive is now UK law. The legislation aims to make producers pay for the collection, treatment and recovery of waste electrical equipment. The regulations also mean that suppliers of equipment like high street shops and internet retailers must allow consumers to return their waste equipment free of charge. The amount of WEEE we throw away is increasing by around 5% each year, making it the fastest growing waste stream in the UK. Much of the UKs WEEE ends up in landfill, where the lead and other toxins it contains can cause soil and water contamination. This can have a harmful effect on natural habitat, wildlife and also human health. Many electrical items that we throw away can be repaired or recycled. Recycling items helps to save our natural finite resources and also reduces the environmental and health risks associated with sending electrical goods to landfill. Distributors of new Electric and Electronic Equipment (EEE) have a part to play in reducing the amount of WEEE going into landfill sites. For example, if a customer bought a new satellite receiver from us we would accept their old satellite receiver and prevent it going into a landfill site by disposing of it safely. Customers must return their WEEE item to us within 28 days of purchasing their new item. How do I recycle my old products? Products are marked with this symbol above to remind you not to throw your electrical equipment in your bin with normal household waste but to arrange for the product to be recycled. Please carefully package any item to avoid transit damage. We will then deal with the waste product in an environmentally responsible manner, at no cost to you. You can also take it to your local council recycling centre to be disposed in an environmentally responsible manner. We cannot reimburse carriage charges for this service. A little about us.. We’re a UK Based leading supplier of Satellite supplies, Audio visual supplies and home & office furniture. The item “Jultec JRM05012T Multiswitch 5 in 12 out No PSU Power By The Satellite Receiver” is in sale since Sunday, February 11, 2018. This item is in the category “Sound & Vision\TV Reception & Set-Top Boxes\Satellite Multiswitchers”. The seller is “bbm_trading_ltd” and is located in Tonbridge. This item can be shipped to United Kingdom, Austria, Belgium, Bulgaria, Croatia, Cyprus, Czech republic, Denmark, Estonia, Finland, France, Germany, Greece, Hungary, Ireland, Italy, Latvia, Lithuania, Luxembourg, Malta, Netherlands, Poland, Portugal, Romania, Slovakia, Slovenia, Spain, Sweden, Australia, United States, Russian federation, Canada, Japan, New Zealand, China, Israel, Hong Kong, Norway, Indonesia, Malaysia, Mexico, Singapore, South Korea, Switzerland, Taiwan, Thailand, Chile. Welcome to BBM Trading. Furniture & Home Ware. 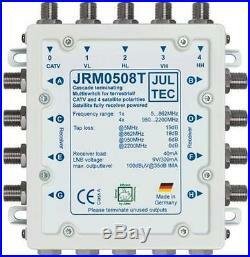 Jultec JRM05016T Multiswitch 5 in 16 out No PSU Power By The Satellite Receiver. The devices JRM0516A, JRM0516M and JRM0516T are multiswitches for complete receiver-fed distribution networks for a satellite system. With a new energy-efficient Powermanagement concept , a single receiver is able to supply both the multi-switch and the connected quatro-LNB with energy. This means that no power supply is required at the multi-switch and there are no standby losses (ie absolutely no power consumption when all receivers are switched off). A conventional satellite receiver (DVB-S / S2) with 14V / 18V / 22kHz control can be operated on each of the 16 feeders (also with TV with integrated satellite receiver). All device variants are also suitable for the distribution of terrestrial signals (FM, DAB +, DVB-T / T2, 3-hole stereo socket such as JAD300TRS) and distribution of cable television signals including Internet access / telephony (DVB-C / C2) Including DOCSIS 3, use a 4-hole can, such as JAD400TRSM. This distribution works even without satellite receiver! The JRM0516A has trunk / cascade outputs, the JRM0516T is terminated (as a single or terminator). The JRM0516M is cascadable in the satellite ZF, terrific terminated. The power requirement per receiver does not increase with cascading. Product features Application example: Receiving a satellite and distributing it on up to 12 satellite receivers Cascadable (expandable) Number of outputs: 16 Isolation port to port (Sat):> 26 dB Max. BBM Trading Ltd Company Registration number: 05554913 and VAT number: GB115 1373 50 Launched in 2005 we have built a reputation on delivering quality goods along with first class customer service. To prevent fraud items are only sent to the card holders billing address. We provide invoices displaying the UK’s current VAT rate. You do not need to give us any reason for cancelling your contract, nor will you have to pay any penalty. You cannot cancel your contract if the goods you have ordered are viewing cards and their subscription has been started. Package the items securely and send them to us with the invoice. Note that you will be responsible for the costs of returning the goods to us unless we delivered the item to you in error. The card is NOT covered if broadcasting stops due to the broadcaster going out of business or a change in schedules, or if the broadcast infringes UK broadcast law. If this is the case we are not liable for this action and you have bought said subscription cards with this knowledge. We reserve the right to withdraw any item or offer at anytime. Unfortunately this isnt always in our control, and mistakes and breakages do happen. On expensive items it might also be a good idea to insure the goods for their full value, as we cannot accept liability for any damage or lost items incurred in transit. Whilst at all times, we try to assure you of the best possible service, however in accepting this, your statutory rights are not affected or limited in any way. Once you place an order you can cancel the order by calling us on within 1 hour of placing it (this should guarantee that your order has not already been picked and sent). UK law is the applicable law. We do not pass-on or sell customers contact details. On-line credit-card saftey is our main goal please see our security page for info. We never send out unsolicited emails 7. WEEE Requlations The Waste Electrical and Electronic Equipment (WEEE) Directive is now UK law. The legislation aims to make producers pay for the collection, treatment and recovery of waste electrical equipment. The regulations also mean that suppliers of equipment like high street shops and internet retailers must allow consumers to return their waste equipment free of charge. The amount of WEEE we throw away is increasing by around 5% each year, making it the fastest growing waste stream in the UK. Much of the UKs WEEE ends up in landfill, where the lead and other toxins it contains can cause soil and water contamination. This can have a harmful effect on natural habitat, wildlife and also human health. Many electrical items that we throw away can be repaired or recycled. Recycling items helps to save our natural finite resources and also reduces the environmental and health risks associated with sending electrical goods to landfill. Distributors of new Electric and Electronic Equipment (EEE) have a part to play in reducing the amount of WEEE going into landfill sites. For example, if a customer bought a new satellite receiver from us we would accept their old satellite receiver and prevent it going into a landfill site by disposing of it safely. Customers must return their WEEE item to us within 28 days of purchasing their new item. How do I recycle my old products? Products are marked with this symbol above to remind you not to throw your electrical equipment in your bin with normal household waste but to arrange for the product to be recycled. Please carefully package any item to avoid transit damage. We will then deal with the waste product in an environmentally responsible manner, at no cost to you. You can also take it to your local council recycling centre to be disposed in an environmentally responsible manner. We cannot reimburse carriage charges for this service. A little about us.. We’re a UK Based leading supplier of Satellite supplies, Audio visual supplies and home & office furniture. The item “Jultec JRM05016T Multiswitch 5 in 16 out No PSU Power By The Satellite Receiver” is in sale since Sunday, February 11, 2018. This item is in the category “Sound & Vision\TV Reception & Set-Top Boxes\Satellite Multiswitchers”. The seller is “bbm_trading_ltd” and is located in Tonbridge. This item can be shipped to United Kingdom, Austria, Belgium, Bulgaria, Croatia, Cyprus, Czech republic, Denmark, Estonia, Finland, France, Germany, Greece, Hungary, Ireland, Italy, Latvia, Lithuania, Luxembourg, Malta, Netherlands, Poland, Portugal, Romania, Slovakia, Slovenia, Spain, Sweden, Australia, United States, Russian federation, Canada, Japan, New Zealand, China, Israel, Hong Kong, Norway, Indonesia, Malaysia, Mexico, Singapore, South Korea, Switzerland, Taiwan, Thailand, Chile. Welcome to BBM Trading. Furniture & Home Ware. 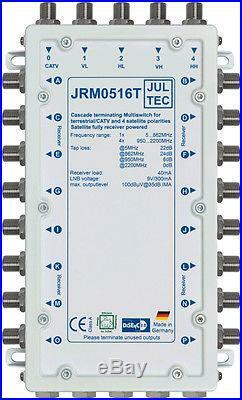 Jultec JRM05016T Multiswitch 5 in 16 out No PSU Powered By The Satellite Receiver. The devices JRM0516A, JRM0516M and JRM0516T are multiswitches for complete receiver-fed distribution networks for a satellite system. With a new energy-efficient Powermanagement concept , a single receiver is able to supply both the multi-switch and the connected quatro-LNB with energy. This means that no power supply is required at the multi-switch and there are no standby losses (ie absolutely no power consumption when all receivers are switched off). A conventional satellite receiver (DVB-S / S2) with 14V / 18V / 22kHz control can be operated on each of the 16 feeders (also with TV with integrated satellite receiver). All device variants are also suitable for the distribution of terrestrial signals (FM, DAB +, DVB-T / T2, 3-hole stereo socket such as JAD300TRS) and distribution of cable television signals including Internet access / telephony (DVB-C / C2) Including DOCSIS 3, use a 4-hole can, such as JAD400TRSM. This distribution works even without satellite receiver! The JRM0516A has trunk / cascade outputs, the JRM0516T is terminated (as a single or terminator). The JRM0516M is cascadable in the satellite ZF, terrific terminated. The power requirement per receiver does not increase with cascading. Product features Application example: Receiving a satellite and distributing it on up to 12 satellite receivers Cascadable (expandable) Number of outputs: 16 Isolation port to port (Sat):> 26 dB Max. BBM Trading Ltd Company Registration number: 05554913 and VAT number: GB115 1373 50 Launched in 2005 we have built a reputation on delivering quality goods along with first class customer service. To prevent fraud items are only sent to the card holders billing address. We provide invoices displaying the UK’s current VAT rate. You do not need to give us any reason for cancelling your contract, nor will you have to pay any penalty. You cannot cancel your contract if the goods you have ordered are viewing cards and their subscription has been started. Package the items securely and send them to us with the invoice. Note that you will be responsible for the costs of returning the goods to us unless we delivered the item to you in error. The card is NOT covered if broadcasting stops due to the broadcaster going out of business or a change in schedules, or if the broadcast infringes UK broadcast law. If this is the case we are not liable for this action and you have bought said subscription cards with this knowledge. We reserve the right to withdraw any item or offer at anytime. Unfortunately this isnât always in our control, and mistakes and breakages do happen. On expensive items it might also be a good idea to insure the goods for their full value, as we cannot accept liability for any damage or lost items incurred in transit. Whilst at all times, we try to assure you of the best possible service, however in accepting this, your statutory rights are not affected or limited in any way. Once you place an order you can cancel the order by calling us on 01892 833007 within 1 hour of placing it (this should guarantee that your order has not already been picked and sent). UK law is the applicable law. We do not pass-on or sell customers contact details. On-line credit-card saftey is our main goal please see our security page for info. We never send out unsolicited emails 7. WEEE Requlations The Waste Electrical and Electronic Equipment (WEEE) Directive is now UK law. The legislation aims to make producers pay for the collection, treatment and recovery of waste electrical equipment. The regulations also mean that suppliers of equipment like high street shops and internet retailers must allow consumers to return their waste equipment free of charge. The amount of WEEE we throw away is increasing by around 5% each year, making it the fastest growing waste stream in the UK. Much of the UKâs WEEE ends up in landfill, where the lead and other toxins it contains can cause soil and water contamination. This can have a harmful effect on natural habitat, wildlife and also human health. Many electrical items that we throw away can be repaired or recycled. Recycling items helps to save our natural finite resources and also reduces the environmental and health risks associated with sending electrical goods to landfill. Distributors of new Electric and Electronic Equipment (EEE) have a part to play in reducing the amount of WEEE going into landfill sites. For example, if a customer bought a new satellite receiver from us we would accept their old satellite receiver and prevent it going into a landfill site by disposing of it safely. Customers must return their WEEE item to us within 28 days of purchasing their new item. How do I recycle my old products? Products are marked with this symbol above to remind you not to throw your electrical equipment in your bin with normal household waste but to arrange for the product to be recycled. So that we can provide you with a return reference and details of our WEEE recycling address. Please carefully package any item to avoid transit damage. We will then deal with the waste product in an environmentally responsible manner, at no cost to you. You can also take it to your local council recycling centre to be disposed in an environmentally responsible manner. We cannot reimburse carriage charges for this service. We pride ourselves on our Feedback and have worked really hard to maintain our ratings. Should you feel that we have not delivered on our promises then please contact me on 01892 833007 so that we can try and rectify any issues before you leave your Feedback. A little about us.. We’re a UK Based leading supplier of Satellite supplies, Audio visual supplies and home & office furniture. The item “Jultec JRM05016T Multiswitch 5 in 16 out No PSU Power By The Satellite Receiver” is in sale since Friday, July 07, 2017. This item is in the category “Sound & Vision\TV Reception & Set-Top Boxes\Satellite Multiswitchers”. The seller is “bbm_trading_ltd” and is located in Tonbridge. This item can be shipped to United Kingdom, Austria, Belgium, Bulgaria, Croatia, Cyprus, Czech republic, Denmark, Estonia, Finland, France, Germany, Greece, Hungary, Ireland, Italy, Latvia, Lithuania, Luxembourg, Malta, Netherlands, Poland, Portugal, Romania, Slovakia, Slovenia, Spain, Sweden, Australia, United States, Russian federation, Canada, Japan, New Zealand, China, Israel, Hong Kong, Norway, Indonesia, Malaysia, Mexico, Singapore, South Korea, Switzerland, Taiwan, Thailand, Chile. Welcome to BBM Trading. Furniture & Home Ware. Jultec JRM0508T Multiswitch 5 in 8 out No PSU Powered By The Satellite Receiver. The devices JRM0508A, JRM0508M and JRM0508T are multiswitches for complete receiver-fed distribution networks for a satellite system. With a new energy-efficient Powermanagement concept, a single receiver is able to supply both the multi-switch and the connected quattro-LNB with energy. This means that no power supply is required at the multi-switch and there are no standby losses (ie absolutely no power consumption when all receivers are switched off). A conventional satellite receiver (DVB-S / S2) with 14V / 18V / 22kHz control can be operated on each of the 8 outputs (also TV with integrated satellite receiver). All device variants are also suitable for the distribution of terrestrial signals (FM, DAB +, DVB-T / T2, 3-hole stereo socket such as JAD300TRS) and distribution of cable television signals including Internet access / telephony (DVB-C / C2) Including DOCSIS 3, use a 4-hole can, such as JAD400TRSM. This distribution works even without satellite receiver! The JRM0508A has trunk / cascade outputs, the JRM0508T is terminated (as a single or terminator). The JRM0508M is cascadable in the satellite ZF, in the Terrestrial terminated. The power requirement per receiver does not increase with cascading. Product features Application example: Receiving a satellite signal and distributing it on up to eight SAT receivers Cascadable (expandable) Number of outputs: 8 Isolation port to port (Sat):> 26 dB Max. BBM Trading Ltd Company Registration number: 05554913 and VAT number: GB115 1373 50 Launched in 2005 we have built a reputation on delivering quality goods along with first class customer service. To prevent fraud items are only sent to the card holders billing address. We provide invoices displaying the UK’s current VAT rate. You do not need to give us any reason for cancelling your contract, nor will you have to pay any penalty. You cannot cancel your contract if the goods you have ordered are viewing cards and their subscription has been started. Package the items securely and send them to us with the invoice. Note that you will be responsible for the costs of returning the goods to us unless we delivered the item to you in error. The card is NOT covered if broadcasting stops due to the broadcaster going out of business or a change in schedules, or if the broadcast infringes UK broadcast law. If this is the case we are not liable for this action and you have bought said subscription cards with this knowledge. We reserve the right to withdraw any item or offer at anytime. Unfortunately this isnât always in our control, and mistakes and breakages do happen. On expensive items it might also be a good idea to insure the goods for their full value, as we cannot accept liability for any damage or lost items incurred in transit. Whilst at all times, we try to assure you of the best possible service, however in accepting this, your statutory rights are not affected or limited in any way. Once you place an order you can cancel the order by calling us on 01892 833007 within 1 hour of placing it (this should guarantee that your order has not already been picked and sent). UK law is the applicable law. We do not pass-on or sell customers contact details. On-line credit-card saftey is our main goal please see our security page for info. We never send out unsolicited emails 7. WEEE Requlations The Waste Electrical and Electronic Equipment (WEEE) Directive is now UK law. The legislation aims to make producers pay for the collection, treatment and recovery of waste electrical equipment. The regulations also mean that suppliers of equipment like high street shops and internet retailers must allow consumers to return their waste equipment free of charge. The amount of WEEE we throw away is increasing by around 5% each year, making it the fastest growing waste stream in the UK. Much of the UKâs WEEE ends up in landfill, where the lead and other toxins it contains can cause soil and water contamination. This can have a harmful effect on natural habitat, wildlife and also human health. Many electrical items that we throw away can be repaired or recycled. Recycling items helps to save our natural finite resources and also reduces the environmental and health risks associated with sending electrical goods to landfill. Distributors of new Electric and Electronic Equipment (EEE) have a part to play in reducing the amount of WEEE going into landfill sites. For example, if a customer bought a new satellite receiver from us we would accept their old satellite receiver and prevent it going into a landfill site by disposing of it safely. Customers must return their WEEE item to us within 28 days of purchasing their new item. How do I recycle my old products? Products are marked with this symbol above to remind you not to throw your electrical equipment in your bin with normal household waste but to arrange for the product to be recycled. So that we can provide you with a return reference and details of our WEEE recycling address. Please carefully package any item to avoid transit damage. We will then deal with the waste product in an environmentally responsible manner, at no cost to you. You can also take it to your local council recycling centre to be disposed in an environmentally responsible manner. We cannot reimburse carriage charges for this service. We pride ourselves on our Feedback and have worked really hard to maintain our ratings. Should you feel that we have not delivered on our promises then please contact me on 01892 833007 so that we can try and rectify any issues before you leave your Feedback. A little about us.. We’re a UK Based leading supplier of Satellite supplies, Audio visual supplies and home & office furniture. The item “Jultec JRM0508T Multiswitch 5 in 8 out No PSU Powered By The Satellite Receiver” is in sale since Friday, July 07, 2017. This item is in the category “Sound & Vision\TV Reception & Set-Top Boxes\Satellite Multiswitchers”. The seller is “bbm_trading_ltd” and is located in Tonbridge. This item can be shipped to United Kingdom, Austria, Belgium, Bulgaria, Croatia, Cyprus, Czech republic, Denmark, Estonia, Finland, France, Germany, Greece, Hungary, Ireland, Italy, Latvia, Lithuania, Luxembourg, Malta, Netherlands, Poland, Portugal, Romania, Slovakia, Slovenia, Spain, Sweden, Australia, United States, Russian federation, Canada, Japan, New Zealand, China, Israel, Hong Kong, Norway, Indonesia, Malaysia, Mexico, Singapore, South Korea, Switzerland, Taiwan, Thailand, Chile. Welcome to BBM Trading. Furniture & Home Ware. Jultec JRM0508A Multiswitch 5 in 8 out No PSU Powered By The Satellite Receiver. The devices JRM0508A, JRM0508M and JRM0508T are multiswitches for complete receiver-fed distribution networks for a satellite system. With a new energy-efficient Powermanagement concept, a single receiver is able to supply both the multi-switch and the connected quattro-LNB with energy. This means that no power supply is required at the multi-switch and there are no standby losses (ie absolutely no power consumption when all receivers are switched off). A conventional satellite receiver (DVB-S / S2) with 14V / 18V / 22kHz control can be operated on each of the 8 outputs (also TV with integrated satellite receiver). All device variants are also suitable for the distribution of terrestrial signals (FM, DAB +, DVB-T / T2, 3-hole stereo socket such as JAD300TRS) and distribution of cable television signals including Internet access / telephony (DVB-C / C2) Including DOCSIS 3, use a 4-hole can, such as JAD400TRSM. This distribution works even without satellite receiver! The JRM0508A has trunk / cascade outputs, the JRM0508T is terminated (as a single or terminator). The JRM0508M is cascadable in the satellite ZF, in the Terrestrial terminated. The power requirement per receiver does not increase with cascading. Product features Application example: Receiving a satellite signal and distributing it on up to eight SAT receivers Cascadable (expandable) Number of outputs: 8 Isolation port to port (Sat):> 26 dB Max. BBM Trading Ltd Company Registration number: 05554913 and VAT number: GB115 1373 50 Launched in 2005 we have built a reputation on delivering quality goods along with first class customer service. To prevent fraud items are only sent to the card holders billing address. We provide invoices displaying the UK’s current VAT rate. You do not need to give us any reason for cancelling your contract, nor will you have to pay any penalty. You cannot cancel your contract if the goods you have ordered are viewing cards and their subscription has been started. Package the items securely and send them to us with the invoice. Note that you will be responsible for the costs of returning the goods to us unless we delivered the item to you in error. The card is NOT covered if broadcasting stops due to the broadcaster going out of business or a change in schedules, or if the broadcast infringes UK broadcast law. If this is the case we are not liable for this action and you have bought said subscription cards with this knowledge. We reserve the right to withdraw any item or offer at anytime. Unfortunately this isnât always in our control, and mistakes and breakages do happen. On expensive items it might also be a good idea to insure the goods for their full value, as we cannot accept liability for any damage or lost items incurred in transit. Whilst at all times, we try to assure you of the best possible service, however in accepting this, your statutory rights are not affected or limited in any way. Once you place an order you can cancel the order by calling us on 01892 833007 within 1 hour of placing it (this should guarantee that your order has not already been picked and sent). UK law is the applicable law. We do not pass-on or sell customers contact details. On-line credit-card saftey is our main goal please see our security page for info. We never send out unsolicited emails 7. WEEE Requlations The Waste Electrical and Electronic Equipment (WEEE) Directive is now UK law. The legislation aims to make producers pay for the collection, treatment and recovery of waste electrical equipment. The regulations also mean that suppliers of equipment like high street shops and internet retailers must allow consumers to return their waste equipment free of charge. The amount of WEEE we throw away is increasing by around 5% each year, making it the fastest growing waste stream in the UK. Much of the UKâs WEEE ends up in landfill, where the lead and other toxins it contains can cause soil and water contamination. This can have a harmful effect on natural habitat, wildlife and also human health. Many electrical items that we throw away can be repaired or recycled. Recycling items helps to save our natural finite resources and also reduces the environmental and health risks associated with sending electrical goods to landfill. Distributors of new Electric and Electronic Equipment (EEE) have a part to play in reducing the amount of WEEE going into landfill sites. For example, if a customer bought a new satellite receiver from us we would accept their old satellite receiver and prevent it going into a landfill site by disposing of it safely. Customers must return their WEEE item to us within 28 days of purchasing their new item. How do I recycle my old products? Products are marked with this symbol above to remind you not to throw your electrical equipment in your bin with normal household waste but to arrange for the product to be recycled. So that we can provide you with a return reference and details of our WEEE recycling address. Please carefully package any item to avoid transit damage. We will then deal with the waste product in an environmentally responsible manner, at no cost to you. You can also take it to your local council recycling centre to be disposed in an environmentally responsible manner. We cannot reimburse carriage charges for this service. We pride ourselves on our Feedback and have worked really hard to maintain our ratings. Should you feel that we have not delivered on our promises then please contact me on 01892 833007 so that we can try and rectify any issues before you leave your Feedback. A little about us.. We’re a UK Based leading supplier of Satellite supplies, Audio visual supplies and home & office furniture. The item “Jultec JRM0508A Multiswitch 5 in 8 out No PSU Powered By The Satellite Receiver” is in sale since Friday, July 07, 2017. This item is in the category “Sound & Vision\TV Reception & Set-Top Boxes\Satellite Multiswitchers”. The seller is “bbm_trading_ltd” and is located in Tonbridge. This item can be shipped to United Kingdom, Austria, Belgium, Bulgaria, Croatia, Cyprus, Czech republic, Denmark, Estonia, Finland, France, Germany, Greece, Hungary, Ireland, Italy, Latvia, Lithuania, Luxembourg, Malta, Netherlands, Poland, Portugal, Romania, Slovakia, Slovenia, Spain, Sweden, Australia, United States, Russian federation, Canada, Japan, New Zealand, China, Israel, Hong Kong, Norway, Indonesia, Malaysia, Mexico, Singapore, South Korea, Switzerland, Taiwan, Thailand, Chile. Welcome to BBM Trading. Furniture & Home Ware. Jultec JRM05012T Multiswitch 5 in 12 out No PSU Powered By The Satellite Receiver. The devices JRM0512A, JRM0512M and JRM0512T are multiswitches for complete receiver-fed distribution networks for a satellite system. With a new energy-efficient Powermanagement concept, a single receiver is able to supply both the multi-switch and the connected quatro-LNB with energy. This means that no power supply is required at the multi-switch and there are no standby losses (ie absolutely no power consumption when all receivers are switched off). A conventional satellite receiver (DVB-S / S2) with 14V / 18V / 22kHz control can be operated on each of the 12 outputs (also with TV with integrated satellite receiver). All device variants are also suitable for the distribution of terrestrial signals (FM, DAB +, DVB-T / T2, 3-hole stereo socket such as JAD300TRS) and distribution of cable television signals including Internet access / telephony (DVB-C / C2) Including DOCSIS 3, use a 4-hole can, such as JAD400TRSM. This distribution works even without satellite receiver! 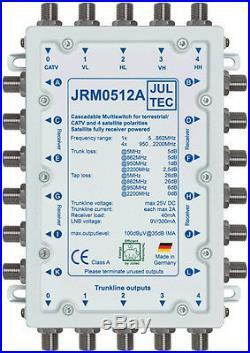 The JRM0512A has trunk / cascade outputs, the JRM0512T is terminated (as a single or terminator). The JRM0512M is cascadable in the satellite IF, terrestrial terminated. The power requirement per receiver does not increase with cascading. Product features Application example: Receiving a satellite and distributing it on up to 12 satellite receivers Cascadable (expandable) Number of outputs: 12 Isolation port to port (Sat):> 26 dB Max. BBM Trading Ltd Company Registration number: 05554913 and VAT number: GB115 1373 50 Launched in 2005 we have built a reputation on delivering quality goods along with first class customer service. To prevent fraud items are only sent to the card holders billing address. We provide invoices displaying the UK’s current VAT rate. You do not need to give us any reason for cancelling your contract, nor will you have to pay any penalty. You cannot cancel your contract if the goods you have ordered are viewing cards and their subscription has been started. Package the items securely and send them to us with the invoice. Note that you will be responsible for the costs of returning the goods to us unless we delivered the item to you in error. The card is NOT covered if broadcasting stops due to the broadcaster going out of business or a change in schedules, or if the broadcast infringes UK broadcast law. If this is the case we are not liable for this action and you have bought said subscription cards with this knowledge. We reserve the right to withdraw any item or offer at anytime. Unfortunately this isnât always in our control, and mistakes and breakages do happen. On expensive items it might also be a good idea to insure the goods for their full value, as we cannot accept liability for any damage or lost items incurred in transit. Whilst at all times, we try to assure you of the best possible service, however in accepting this, your statutory rights are not affected or limited in any way. Once you place an order you can cancel the order by calling us on 01892 833007 within 1 hour of placing it (this should guarantee that your order has not already been picked and sent). UK law is the applicable law. We do not pass-on or sell customers contact details. On-line credit-card saftey is our main goal please see our security page for info. We never send out unsolicited emails 7. WEEE Requlations The Waste Electrical and Electronic Equipment (WEEE) Directive is now UK law. The legislation aims to make producers pay for the collection, treatment and recovery of waste electrical equipment. The regulations also mean that suppliers of equipment like high street shops and internet retailers must allow consumers to return their waste equipment free of charge. The amount of WEEE we throw away is increasing by around 5% each year, making it the fastest growing waste stream in the UK. Much of the UKâs WEEE ends up in landfill, where the lead and other toxins it contains can cause soil and water contamination. This can have a harmful effect on natural habitat, wildlife and also human health. Many electrical items that we throw away can be repaired or recycled. Recycling items helps to save our natural finite resources and also reduces the environmental and health risks associated with sending electrical goods to landfill. Distributors of new Electric and Electronic Equipment (EEE) have a part to play in reducing the amount of WEEE going into landfill sites. For example, if a customer bought a new satellite receiver from us we would accept their old satellite receiver and prevent it going into a landfill site by disposing of it safely. Customers must return their WEEE item to us within 28 days of purchasing their new item. How do I recycle my old products? Products are marked with this symbol above to remind you not to throw your electrical equipment in your bin with normal household waste but to arrange for the product to be recycled. So that we can provide you with a return reference and details of our WEEE recycling address. Please carefully package any item to avoid transit damage. We will then deal with the waste product in an environmentally responsible manner, at no cost to you. You can also take it to your local council recycling centre to be disposed in an environmentally responsible manner. We cannot reimburse carriage charges for this service. We pride ourselves on our Feedback and have worked really hard to maintain our ratings. Should you feel that we have not delivered on our promises then please contact me on 01892 833007 so that we can try and rectify any issues before you leave your Feedback. A little about us.. We’re a UK Based leading supplier of Satellite supplies, Audio visual supplies and home & office furniture. 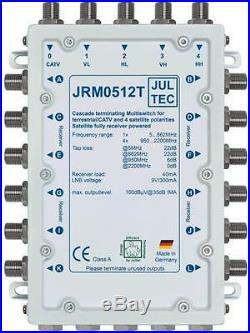 The item “Jultec JRM05012T Multiswitch 5 in 12 out No PSU Power By The Satellite Receiver” is in sale since Friday, July 07, 2017. This item is in the category “Sound & Vision\TV Reception & Set-Top Boxes\Satellite Multiswitchers”. The seller is “bbm_trading_ltd” and is located in Tonbridge. This item can be shipped to United Kingdom, Austria, Belgium, Bulgaria, Croatia, Cyprus, Czech republic, Denmark, Estonia, Finland, France, Germany, Greece, Hungary, Ireland, Italy, Latvia, Lithuania, Luxembourg, Malta, Netherlands, Poland, Portugal, Romania, Slovakia, Slovenia, Spain, Sweden, Australia, United States, Russian federation, Canada, Japan, New Zealand, China, Israel, Hong Kong, Norway, Indonesia, Malaysia, Mexico, Singapore, South Korea, Switzerland, Taiwan, Thailand, Chile. Welcome to BBM Trading. Furniture & Home Ware. Jultec JRM05012A Multiswitch 5 in 12 out No PSU Powered By The Satellite Receiver. The devices JRM0512A, JRM0512M and JRM0512T are multiswitches for complete receiver-fed distribution networks for a satellite system. With a new energy-efficient Powermanagement concept, a single receiver is able to supply both the multi-switch and the connected quatro-LNB with energy. This means that no power supply is required at the multi-switch and there are no standby losses (ie absolutely no power consumption when all receivers are switched off). A conventional satellite receiver (DVB-S / S2) with 14V / 18V / 22kHz control can be operated on each of the 12 outputs (also with TV with integrated satellite receiver). All device variants are also suitable for the distribution of terrestrial signals (FM, DAB +, DVB-T / T2, 3-hole stereo socket such as JAD300TRS) and distribution of cable television signals including Internet access / telephony (DVB-C / C2) Including DOCSIS 3, use a 4-hole can, such as JAD400TRSM. This distribution works even without satellite receiver! The JRM0512A has trunk / cascade outputs, the JRM0512T is terminated (as a single or terminator). The JRM0512M is cascadable in the satellite IF, terrestrial terminated. The power requirement per receiver does not increase with cascading. Product features Application example: Receiving a satellite and distributing it on up to 12 satellite receivers Cascadable (expandable) Number of outputs: 12 Isolation port to port (Sat):> 26 dB Max. BBM Trading Ltd Company Registration number: 05554913 and VAT number: GB115 1373 50 Launched in 2005 we have built a reputation on delivering quality goods along with first class customer service. To prevent fraud items are only sent to the card holders billing address. We provide invoices displaying the UK’s current VAT rate. You do not need to give us any reason for cancelling your contract, nor will you have to pay any penalty. You cannot cancel your contract if the goods you have ordered are viewing cards and their subscription has been started. Package the items securely and send them to us with the invoice. Note that you will be responsible for the costs of returning the goods to us unless we delivered the item to you in error. The card is NOT covered if broadcasting stops due to the broadcaster going out of business or a change in schedules, or if the broadcast infringes UK broadcast law. If this is the case we are not liable for this action and you have bought said subscription cards with this knowledge. We reserve the right to withdraw any item or offer at anytime. Unfortunately this isnât always in our control, and mistakes and breakages do happen. On expensive items it might also be a good idea to insure the goods for their full value, as we cannot accept liability for any damage or lost items incurred in transit. Whilst at all times, we try to assure you of the best possible service, however in accepting this, your statutory rights are not affected or limited in any way. Once you place an order you can cancel the order by calling us on 01892 833007 within 1 hour of placing it (this should guarantee that your order has not already been picked and sent). UK law is the applicable law. We do not pass-on or sell customers contact details. On-line credit-card saftey is our main goal please see our security page for info. We never send out unsolicited emails 7. WEEE Requlations The Waste Electrical and Electronic Equipment (WEEE) Directive is now UK law. The legislation aims to make producers pay for the collection, treatment and recovery of waste electrical equipment. The regulations also mean that suppliers of equipment like high street shops and internet retailers must allow consumers to return their waste equipment free of charge. The amount of WEEE we throw away is increasing by around 5% each year, making it the fastest growing waste stream in the UK. Much of the UKâs WEEE ends up in landfill, where the lead and other toxins it contains can cause soil and water contamination. This can have a harmful effect on natural habitat, wildlife and also human health. Many electrical items that we throw away can be repaired or recycled. Recycling items helps to save our natural finite resources and also reduces the environmental and health risks associated with sending electrical goods to landfill. Distributors of new Electric and Electronic Equipment (EEE) have a part to play in reducing the amount of WEEE going into landfill sites. For example, if a customer bought a new satellite receiver from us we would accept their old satellite receiver and prevent it going into a landfill site by disposing of it safely. Customers must return their WEEE item to us within 28 days of purchasing their new item. How do I recycle my old products? Products are marked with this symbol above to remind you not to throw your electrical equipment in your bin with normal household waste but to arrange for the product to be recycled. So that we can provide you with a return reference and details of our WEEE recycling address. Please carefully package any item to avoid transit damage. We will then deal with the waste product in an environmentally responsible manner, at no cost to you. You can also take it to your local council recycling centre to be disposed in an environmentally responsible manner. We cannot reimburse carriage charges for this service. We pride ourselves on our Feedback and have worked really hard to maintain our ratings. Should you feel that we have not delivered on our promises then please contact me on 01892 833007 so that we can try and rectify any issues before you leave your Feedback. A little about us.. We’re a UK Based leading supplier of Satellite supplies, Audio visual supplies and home & office furniture. The item “Jultec JRM05012A Multiswitch 5 in 12 out No PSU Power By The Satellite Receiver” is in sale since Friday, July 07, 2017. This item is in the category “Sound & Vision\TV Reception & Set-Top Boxes\Satellite Multiswitchers”. The seller is “bbm_trading_ltd” and is located in Tonbridge. This item can be shipped to United Kingdom, Austria, Belgium, Bulgaria, Croatia, Cyprus, Czech republic, Denmark, Estonia, Finland, France, Germany, Greece, Hungary, Ireland, Italy, Latvia, Lithuania, Luxembourg, Malta, Netherlands, Poland, Portugal, Romania, Slovakia, Slovenia, Spain, Sweden, Australia, United States, Russian federation, Canada, Japan, New Zealand, China, Israel, Hong Kong, Norway, Indonesia, Malaysia, Mexico, Singapore, South Korea, Switzerland, Taiwan, Thailand, Chile.